Words with Friends is a multi-player word game developed by Zynga with Friends (formerly Newtoy, Inc.). Players take turns building words crossword puzzle style in a manner similar to the classic board game Scrabble. 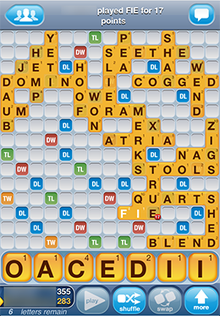 (The rules of the two games are similar, but Words with Friends is not officially associated with the Scrabble brand.) Up to 30 games can be played simultaneously using push notifications to alert players when it is their turn. Players may look up friends either by username or through Facebook, or be randomly assigned an opponent through "Smart Match". Players can also find potential opponents using Community Match. Released in July 2009, Words with Friends is available for cross-platform play on devices running the operating systems Android, Windows Phone, and iOS (iPad, iPhone, iPod Touch). The game is also available on Facebook, Kindle Fire, and Nook Tablet. In addition, there is a chat feature built into the game that allows opponents to exchange messages. Between 2010 and 2011, Words with Friends was one of the top ranking games in the iOS app store, available as both a free ad-supported version and a paid version with no "third party ads between turns". An iPhone Words with Friends Game in progress. The opponent has just played FIE, also forming the word QI, for a score of 17 points. The rules of the game are mostly the same as those of two-player Scrabble, with a few differences such as the arrangement of bonus tiles and some of the letters' point values. Players are given seven randomly chosen letter tiles, which are replenished until all 104 tiles have been used. Players take turns forming words on the board or, instead of playing a word, may also choose to swap tiles with the pool of currently unused tiles or pass their turn. 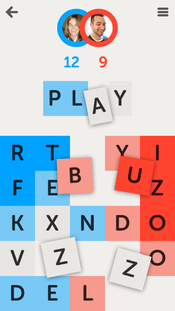 Players can form words either vertically or horizontally on the board. The player's aim is to score as many points as possible. Scores will be doubled if a word is placed on the DW space. The word will have a triple value if it is placed on the TW space. Individual letter's scores can also be doubled or tripled by placing them on the DL or TL space, respectively. 35 Bonus points are awarded to players who use all 7 tiles in a single turn. The game ends when a player plays every tile in his or her rack, and there are no remaining tiles to draw. The game also ends if three scoreless moves (i.e., passes or tile exchanges) are played in succession, unless the score is zero-zero. After playing the last tile, the opposing player will lose all the points equal to the amount of the remaining tiles. This number of points will be awarded to the player who played the last tile. At the end of the game the player with the highest score wins. Players are able to re-arrange the tiles on their rack and can shuffle them randomly. Games may be resigned, and there are two extra features, the "tile bag" and "word-o-meter", accessible for free. Words with Friends accepts 173,000 words in the game. The word list used by the game is based on the Enhanced North American Benchmark Lexicon (ENABLE), with some additions from the developers. Words with Friends was created under contract by Shawn Lohstroh for two brothers Paul and David Bettner who owned Newtoy Inc. at the time. They had no idea how famous the game would become. Since the game’s launch, the random opponent and chat features of the game have led to a number of romantic relationships. In 2009, Megan Lawless, of Chicago, began a game with a random opponent, Jasper Jasperse, who lived in the Netherlands. The two got to know one another via the game’s chat function and married in July 2011. Other couples who met via the game’s random opponent feature include Trish and David Palmer of Dacula, Georgia, who married in November 2011, and Stephen Monahan and Britney Hilbun of Texas, who became engaged to marry in December 2011. In late 2011, it was reported that one of the game’s American players was communicating via the game’s chat function about her Australian opponent’s husband’s medical symptoms. The player relayed the symptoms to her doctor husband, who recommended an immediate hospital visit. The opponent’s husband found he had a 99% blockage close to his heart. On a 2012 episode of the American TV show, The Doctors, the couples were introduced to each other for the first time. In 2012, Zynga, in conjunction with Hasbro, released several physical board game versions of Words with Friends under the "Hasbro Gaming" imprint. These include a standard version, a "Luxe" edition with rotating fitted tile gameboard (similar to the deluxe editions of Scrabble), and a "To Go" travel edition. This is one of several games in the Zynga game library to be released as physical board game versions. Others include Draw Something, a CityVille edition of Monopoly, and several kids' games based on FarmVille. Other similar games include a math version Math With Your Friends, a numbers game Five-O for iOS, an arithmetic gameGoSum for iOS, Letterpress for iOS, Alphajax for Windows Phone, Word Derby for iOS, Spellathon, another numbers game Yushino for iOS, Word Frenzy, Word Mix, Wordfeud, 7 Little Words, and Chiktionary.